Having some meat-free options when it comes to protein is always a good idea! Protein is a vital macronutrient and is essential for our body. From healthy hair to shiny nails, just a few of the result when you consume enough protein. Not to forget, it encourages muscle growth and takes more time to digest than carbs, thus, keeping you full for a longer time. So how much protein should you aim to eat each day? It depends on your size and how active you are, says Tina Gowin, R.D., C.D.N. The general guideline is that 15 percent of your daily calories should be comprised of protein, or about 75 grams (based on a 2,000-calorie diet) for the average adult. Inside my online personal training programs, you receive your own set of customized macronutrient numbers to follow which will tell you exactly how much protein you should be eating to reach your goals. 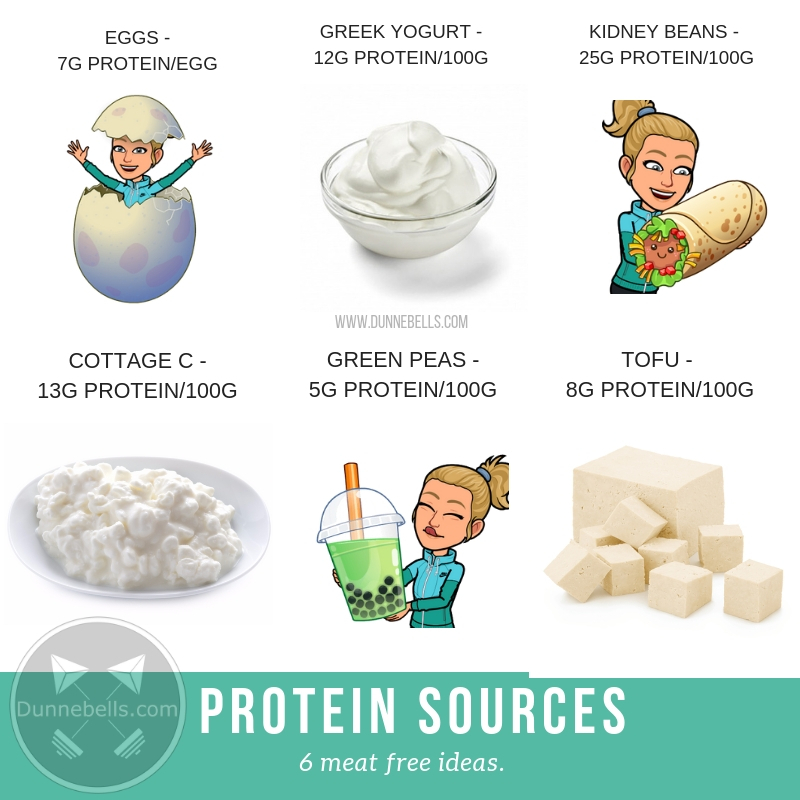 You may have heard that meat and eggs are great sources of protein (and they are), but there are alternatives (including plenty of vegan options!). Don’t be afraid to experiment next time you are hungry with these top choices for high-protein foods that are meat-free. Okay, so the argument still stands on whether eggs are consumed by vegetarians. I am not forcing you to eat eggs but I wanted to provide you with the option because they are just such a good source of protein! A single egg contains around 7 grams of high-quality protein. And not only protein, eggs are also rich in Vitamin A, Vitamin E, Vitamin K and an array of B Vitamins like Vitamin B12, folic acid and riboflavin. Here is a perfect black bean brownies recipe using eggs. Greek yogurt is low in calories, high in protein and is thicker yoghurt with a much creamier texture. 100 grams of Greek Yoghurt contains approx. 12 grams of protein. Kidney beans are one of the best protein sources loaded with dietary fiber, iron, phosphorus, folate, potassium and magnesium. 100 grams of Kidney beans contain 25 grams of protein. Here are the top 5 Benefits of Kidney Beans. Cottage cheese contains nutrients that are extremely helpful for a healthy living. Protein, vitamins, and minerals, it has them all. The cheery on the cake is, while being an excellent protein source, it has relatively very few calories. 100 grams of cottage cheese contain 13 grams of protein. Green peas are a powerhouse when it comes to vitamins. They contain Vitamins A, B1, B6, C and K and are high in fiber, low in fat with zero cholesterol. 100 grams of green peas contain 5 grams of protein. Tofu is a soya bean curd and is prepared like that of cheese. It is a plant food, but unlike others, it is fully loaded with all the crucial amino acids, which are the building blocks of protein in our body. It also contains copper, iron and phosphorus. 100 grams of Tofu contain 8 grams of protein. Sesame Tofu Quinoa Bowl - The Almond Eater. For weekly challenges and community support, join my free Facebook group here. Do you have some helpful tips on meat-free protein sources? Tag @dunnebells_ on Instagram to possibly be featured!